I just wandered over to my computer after spending a solid 10 minutes staring at the new concrete patio currently curing in my back yard. A patio! We are so excited. It is dark-tint concrete, and so pretty. Like geniuses, though, we moved the barbeque around the side of the house, behind the patio, to keep it out of the way of the workmen. Geniuses, because we can’t drag anything across the concrete for a few days, which means, if we want to grill all these brats and hot dogs my husband bought for dinner tonight, he and I have to go out and lift the grill, gas attached, and then carry it 20 feet to the lawn.Because concrete is precious and delicate. Some days I just don’t know how either of us survived this long, what, with our awesome forethought skills and all. We are excited about grilling. I mean, really excited. We don’t know how to do it, but after 15 years of apartment living, having a grill and a back patio was one of the top 10 reasons for moving to a house. So far, the kids seem unimpressed with the results, but they do love the fact that, “Daddy is SpongeBob!” and they pretend whatever he is making is actually a Krabby Patty. They are easily impressed. I love the grill, because it relegates me to ‘sides and desserts’, which I am fine with. Right now, I am pushing hard on what I call “Cheaters Strawberry Shortcake,” because our local grocery is overrun with strawberries. 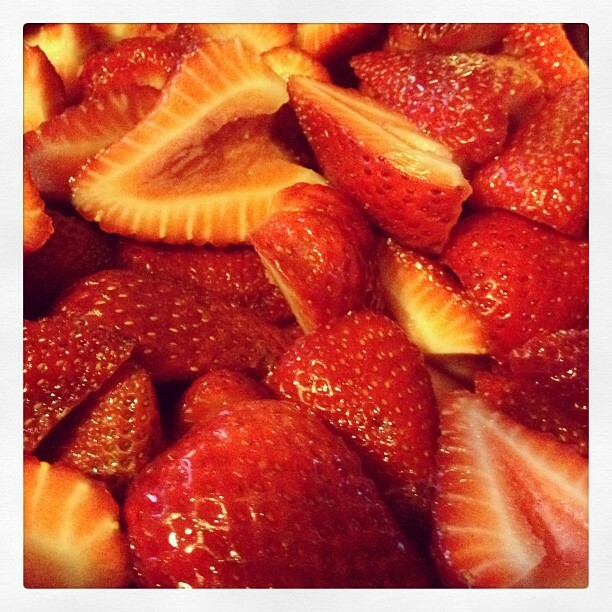 Take a lot of strawberries, and core/cut up the ugly ones. Mash them with a potato masher, and sprinkle sugar on them. Mix it up. Then cute up the pretty ones, and drop them in the mix. Refrigerate, then pour over store bought pound cake. Top with sweetened whipping cream. It looks so impressive, and tastes so good, and takes zero time and only the slightest bit of effort. If only all of life could be so. I’d like to show you pictures of the kids playing outside, delighting in the long weekend, but it is less than 60 degrees here, and I am wearing a reindeer sweater while I type this. In May. A few nights ago, we had a frost. Frost! Not sure what happened to Spring and Summer, but we sure are enjoying this fine Autumn weather. It won’t stop us from barbequing. We will be the idiots out in the backyard, wrapped up in down coats and winter boots, grilling.